If I was an animal I really think I would be a magpie! As I’m attracted to anything sparkly and covered in glitter. 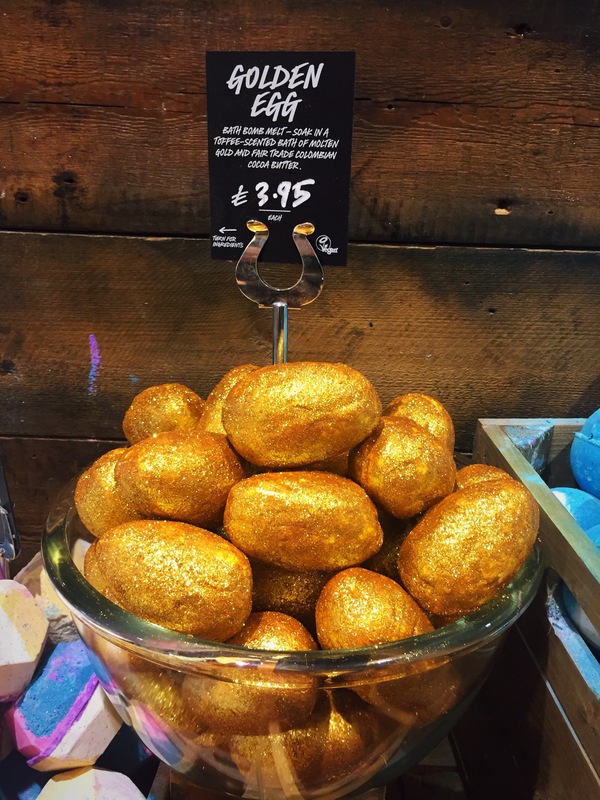 The golden egg bath bomb melt was first realised in 2014 and is a product that I always look forward to getting from the Easter range. I was so excited to see that the golden egg was back this year and couldn’t wait to get my hands on one. As the name suggests, the golden egg is an egg shaped product. I love how In keeping this design is with the theme of the Easter range. 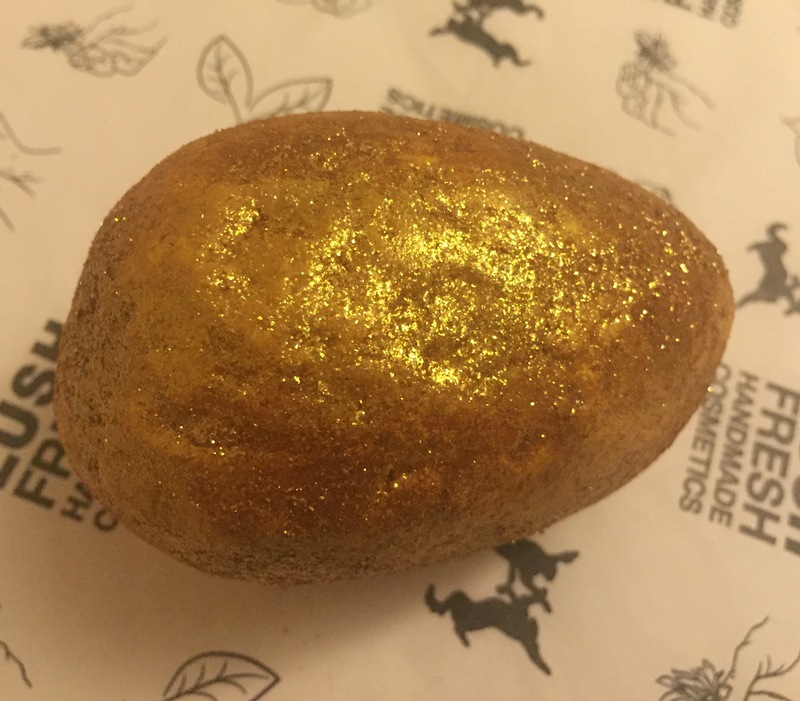 A lot smaller than an average bath bomb, this little egg it absolutely cover in loads and loads of sparkly gold glitter. If you not a huge fan of glitter this might not be the best bath product for you. 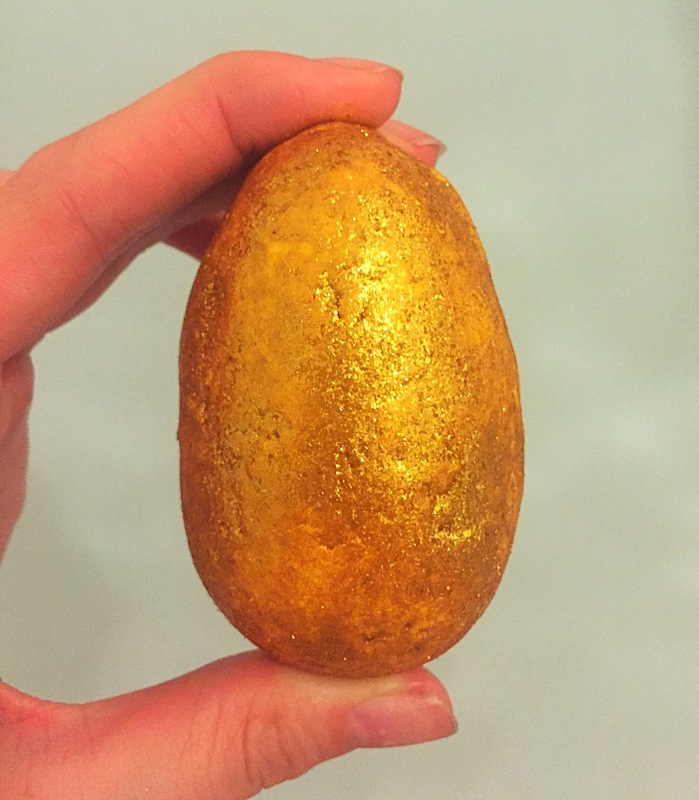 What makes this little egg extra special is that it is half bath bomb and half bath melt! This mix creates a wonderful hybrid product which I really wish lush made more of. The scent of the golden egg is a very warming and sweet toffee scent. For those of you who know you lush scents well this product is of the honey I washed the kid scent family. I found that this creamy sweet scent was just the right strength to not be over powering or to be to weak that you could hardly smell it. The product filled the room with its stunning toffee aroma for the whole of my bath. I also found that this product left a touch of scent on the skin meaning I kept picking up on it throughout my evening. The outer shell of this product is the ‘bath melt’ part. Containing an ample amount of cocoa butter , once popped in the water the outer shell slowly starts to melt and dissolve. As it melts it disperses its covering of glitter giving the bath water a lovely shimmer. 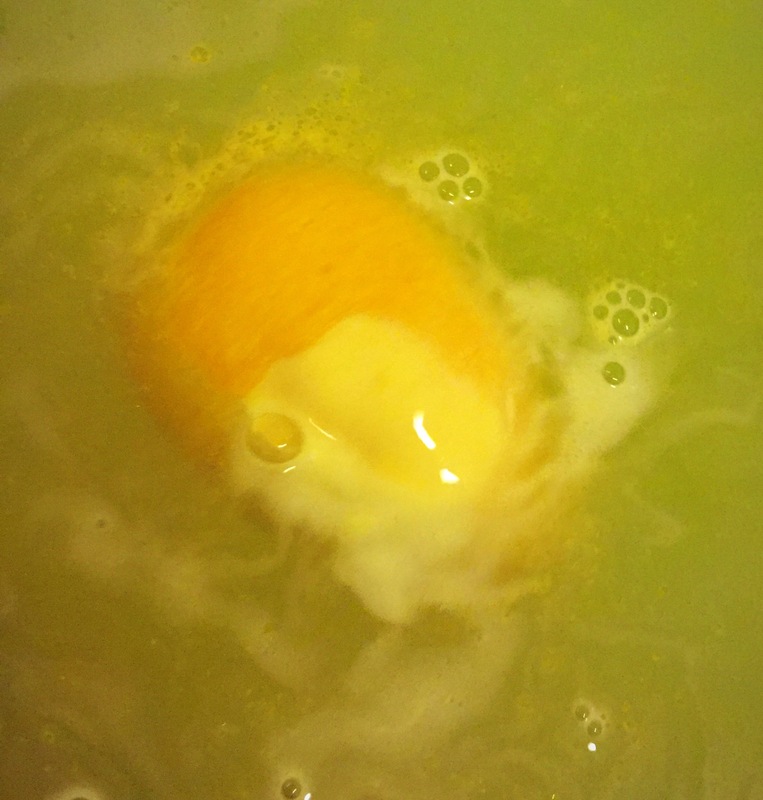 Once the outer shell of the egg has dissolved l, the egg starts to spin round and round as the bath bomb part of the product starts to react with the water. This releases a lovely creamy yellow foam accross the surface of the water, Turing the bath water a golden yellow colour. 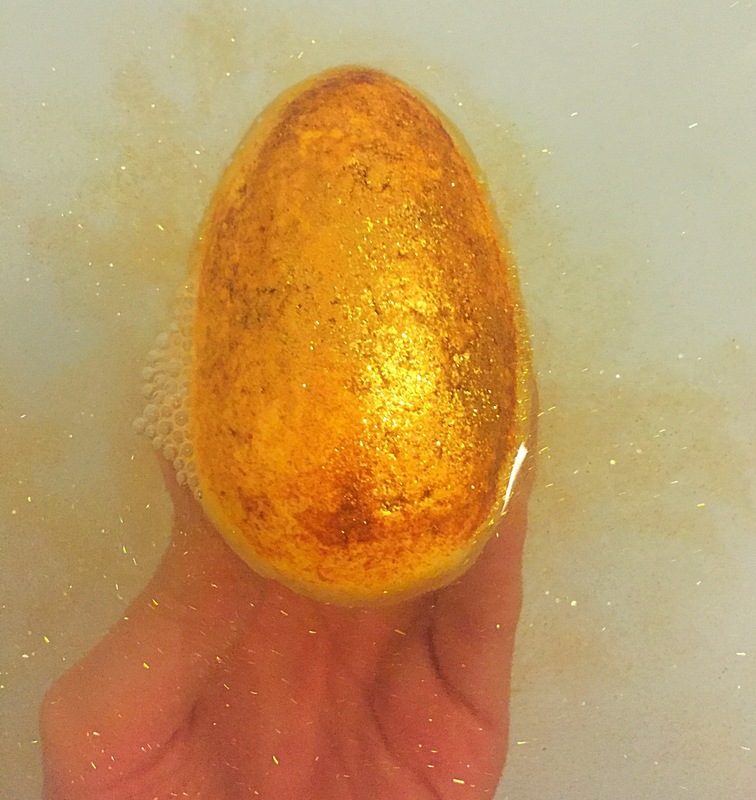 The golden egg takes ages to fully dissolve meaning this product is perfect for a long relaxing bath. Overall I adore this product, the scent is Devine and there is just the right amount of glitter to add shimmer to the water but to not mean you have to scrub your tub for ages to remove the left over glitter. I know I will defiantly be picking a few more of these up to last me trough the year. Ingredients – Sodium Bicarbonate, Fair Trade Organic Colombian Cocoa Butter, Citric Acid, Laureth 4, Cream of Tartar, Sodium Laureth Sulfate, Perfume, Sweet Wild Orange Oil, Bergamot Oil, Olive Oil, Cornflour, Lauryl Betaine, Amyl Cinnamal, Citronellol, Geraniol, Lilial,Linalool, Limonene, Gardenia Extract, Colour 19140:1, Radiant Gold Lustre, Gold Glimmer Lustre.